An extraordinary cooker demands a unique range of cookware, which is why every item in the AGA Cookshop Collection has been crafted to the same exacting standards as our cookers. 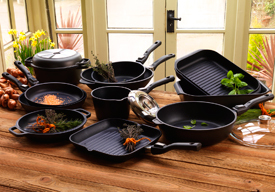 AGA Cookshop’s range of cookware is developed by experts to offer the best possible performance and durability, ensuring you get the best from your AGA cooker. Designed with style, quality and flexibility in mind and with great attention to even the smallest of detail, each piece is rigorously tested so you can be sure of unparalleled quality, value and durability. British made AGA cast iron cookware is made to this day in Coalbrookdale, according to the patent granted to Abraham Darby by Queen Anne in 1707 for the casting of cast iron pots. Cast iron retains heat perfectly, radiating onto food to lock in flavours and succulence. 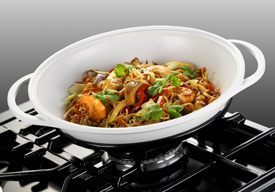 It is also the perfect oven-to-tableware – not only because it keeps your food warm, but because it looks great too! 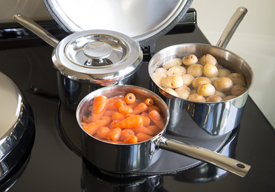 Swiss made AGA stainless steel cookware offers the best durability possible. The heavy thermal base, with its patented wave technology is designed for maximum efficiency, allowing perfect contact with the hotplate. The unique flat lid design allows for easy stacking in any of the ovens – ensuring you make the most of space. Ideal for cooking healthy meals from scratch the non-stick AGA cast aluminium range features scratch resistant Teflon Platinium Plus coating, making cooking with less fat simple. 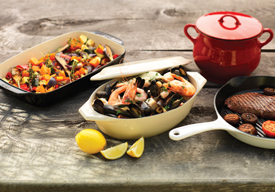 Lightweight yet equally robust, this stunning range of cookware is so easy to cook with. The high quality, durable, stainless steel induction base gives quick even heat distribution and retention, making it highly energy efficient. 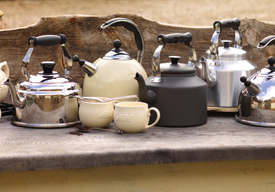 AGA Cookshop offers kettles in a wide range of styles, sizes and finishes. Our kettles are designed for maximum performance, with a thick solid base, ensuring a quick boiling time. 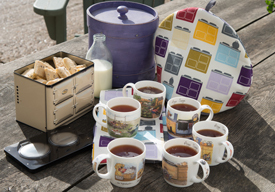 Get the most out of your AGA with our range of AGA essentials. 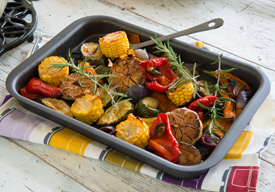 From our roasting tins and baking trays, designed to fit directly onto the AGA oven runners, to a range of AGA Bake-O-Glide liners that are non-stick and dishwasher safe for easy cleaning and can be used again and again. 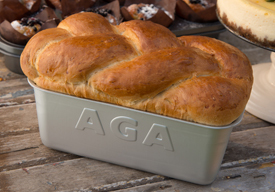 AGA non-stick bakeware offers professional performance for every kind of baker. The heavy gauge steel offers excellent heat distribution and the PFOA free coating means food will slide out of the cookware easily. 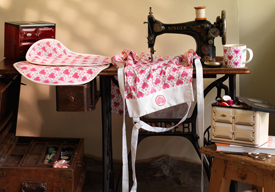 A range of beautiful kitchen textiles, all designed with a keen attention to detail to deliver superior performance. Extra long gauntlets and double oven gloves, with their steam and grease barrier, provide maximum protection, whilst multi-purpose chef’s pads can be used as pot grabs or to protect dome lids or work sufaces. Inspired by busy everyday life in the kitchen, our range of AGA accessories are designed to be both stylish and practical, accommodating the great demands of a versatile life in the kitchen and dining room alike. Your AGA works hard for you all year round and needs a little care too. To keep it looking in show room condition, the range features product specially developed to clean warm surfaces without smearing or damaging. For orders up to €150,00 there will be a delivery charge depending on the total weight of your cart items. Delivery is free of charge for orders of €150,00 and over. Please note due to stock availability, orders with multiple items maybe despatched separately. Please note that delivery can take place any time up to 5.30 p.m. We are unable to offer timed deliveries. When selecting products we always put quality first and we inspect every item prior to dispatch, however, if your goods are damaged in transit or deemed faulty please notify us as soon as possible by telephoning +32 9 228 14 84 or email us at info@cookup.be. A customer advisor will be able to take your call Tuesday to Friday from 9.30 until 12.30 & from 13.30 until 17.30, and can arrange a return note for you. Please note that this call can be recorded for security and training purposes. COOK UP – Alfa Belgium nv does not take any responsibility for items returned with no paperwork. Once a return note has been issued, you have 14 days to return your order. Once 14 days has elapsed, COOK UP – Alfa Belgium nv will refund or replace only at their discretion on a case by case basis. Replacement orders will only be dispatched to you once the initial order has been received by COOK UP – Alfa Belgium nv or proof of delivery to COOK UP has been supplied to us. We hope your shopping experience here at COOK UP is one you enjoy, if you think there are any areas we can improve our site we would like to hear your feedback. Browse the shop by highlighting and clicking on the product categories located on the top main menu. Alternatively, if you know what you are looking for; enter the the search term in the search box at the right top of the page. You can narrow your search on a category or search results page by filtering the price, features, brands or other attributes, by selecting the parameters on the left side. Click on the product image or title to see more information and images on that product. When you find a product you’d like to buy, click on “Add to Cart” button (changing the quantity if you’d like more than one). The item will now be added to your basket. All prices in our shop include VAT. When you have finished shopping click on the cart or checkout buttons to be taken through the simple and secure payment process. After clicking the Checkout button you will be asked to enter your email address, and password, depending if you have already set up an account with us on this new site. Alternatively, if you have not registered with us on this site before; tick the box with “Proceed to Checkout” button. Continue entering your information. Passwords should be something not easily guessable or obvious and more than 6 characters, leading or trailing spaces will be ignored. Enter the billing address, if your shipping address is different to your billing address tick the option which says “Ship to a different address?”. This should then allow you to enter a new address which is where your goods will be send to. You can place an order using VISA Credit, MasterCard, Maestro, Paypal, KBC Online and CBC Online. We use PayPage for our online card payments. PayPage has the highest level of card data security to protect from data theft and fraud. Any valid COOK UP Coupon codes should be redeemed at the basket stage where it says “Apply Coupon” and applied. As soon as you place an order you will see a confirmation page with your order number and receive a confirmation email. Check Spam or other folders if you do not see the email in your usual inbox. Please double-check the information in your confirmation email and if anything is incorrect contact COOK UP as soon as possible. All orders are placed with COOK UP SHOP which is a business name of ALFA BELGIUM NV under VAT Number BE0423.387.182. Registered Office Address – Nijverheidskaai 2, 9040 Ghent. These terms and conditions will apply to all sales of products made between COOK UP SHOP and our customers. For deliveries to Belgium: For orders up to €150,00 there will be a delivery charge depending on the total weight of your cart items. Delivery is free for orders of €150,00 and over. 4.3 When your goods are dispatched from our warehouse we will send you a dispatch confirmation email. Order acceptance and completion of the contract between you and us will take place on the dispatch to you of the goods ordered unless we have notified you that we do not accept your order, or unless you have cancelled it in accordance with section 8 (below). 5.2 We quote the price inclusive of VAT. We will charge you the price inclusive of VAT, at the rate applying at the time of delivery. VAT is currently (November 2016) 21% for all goods we sell with the exception of Books (6%). 5.5 You must pay by MasterCard, Visa, Maestro cards, KBC Online, CBC Online or PayPal. We regret we are unable to accept other means of payment. 7.2 You must inspect the goods on delivery. If any goods are damaged (or not delivered), please let us know as soon as possible by emailing us at info@cookup.be. We reserve the right to ask you to send us reasonable evidence of any damaged goods. 8.1 If you wish to amend an order then please contact our online enquiries team on +32 9 228 14 84 or at info@cookup.be. 8.2 You will have a right to cancel this contract without providing any reasons, within 14 days of delivery, beginning on the day after the date on which we deliver the goods to you (“Cancellation Period”). 8.4 If you wish to cancel this contract during the Cancellation Period then please contact us to let us know. Examples of ways you can do this include by email to info@cookup.be or by telephoning +32 9 228 14 84. It is also possible for you to send the below cancellation form to us at COOK UP, Nijverheidskaai 2, 9040 Ghent or by email to info@cookup.be. It is sufficient for you to have sent your cancellation notice within the Cancellation Period. 8.5 Please note that you will be responsible for returning your goods to us, and you will be responsible for any costs incurred in doing this. If the goods cannot be returned by post, please contact Customer Services on +32 9 228 14 84 and we will assist you with returning your goods and will provide an indication of the costs for this. 8.6 Once you have provided us with notice that you will be cancelling your contract you must return the goods to us within 14 days to the following address: COOK UP, Nijverheidskaai 2, 9040 Ghent. Nothing in this clause shall affect your legal rights as a consumer. 8.12 In the unlikely event that you are unhappy with your goods or our service, and you wish to make a complaint, please forward your complaint in writing to us at info@cookup.be, and a member of our customer service team will contact you. 11.1 Belgian law is applicable to any contract made under these terms. 11.8 It is our intention to comply at all times with all relevant Belgian laws including Health and Safety at Work and Environmental Protection Acts. Under the Weapon Law, article 19°;2°, it is an offence to sell knives to anyone under the age of 18 years. No order shall be accepted for the supply of any knife to a person under the age of 18 years. 11.9.1 All orders are placed with COOK UP, which is a trading name of Alfa Belgium nv, Registered Office: Nijverheidskaai 2, 9040 Ghent, VAT Registration No. BE0423.387.182. COOK UP is a business name of Alfa Belgium nv. Registered in Belgium under VAT Number BE0423.387.182. Registered Office Address – Nijverheidskaai 2, 9040 Ghent. The contents of this site are intended for your personal use only and may not be displayed or reproduced without our written permission. The contents of this site may be downloaded or copied for personal use. While every effort is made to ensure the accuracy of the information on this site, COOK UP disclaims all warranties concerning accuracy. COOK UP will not be liable for any damages of any kind related to the use of this site. COOK UP reserves the right to amend, add, omit or alter any aspect of this site at our discretion and without prior notice. cookup.be is a site operated by Alfa Belgium nv (“COOK UP”, “we”, or “us”). We are registered in Belgium under company number BE0423.387.182 and have our registered office at Nijverheidskaai 2, 9040 Ghent, Belgium. Our main trading address for COOK UP Shop is Aga Cookshop is Nijverheidskaai 2, 9040 Ghent, Belgium. BE0423.387.182You may contact us at this address or by email to info@cookup.be or phone us on +32 9 228 14 84. We may contact you for marketing purposes by email, mail or telephone with relevant offers from COOK UP. We may also contact you for market research purposes. You can opt out of some or all communication at any time by telephoning us on +32 9 228 14 84 or by writing to Alfa Belgium nv at Head Office or via info@cookup.be, quoting Security and Privacy Enquiry. By breaching this provision, you would commit a criminal offence under the Belgian Penal Code. We will report any such breach to the relevant law enforcement authorities and we will co-operate with those authorities by disclosing your identity to them. In the event of such a breach, your right to use our site will cease immediately. The Belgian courts will have exclusive jurisdiction over any claim arising from, or related to, a visit to our site although we retain the right to bring proceedings against you for breach of these conditions in your country of residence or any other relevant country. 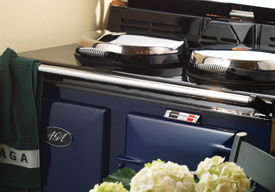 AGA, Rayburn, Rangemaster, Falcon are UK registered trade marks of the AGA Rangemaster Group, and are the principal trade marks among a much larger number of nationally and internationally registered trade marks. © Copyright 2016 COOK UP – Alfa Belgium nv, Nijverheidskaai 2, 9040 Ghent.